I just won an AT&T teal blue 500 on eBay. I've been looking for one of these for awhile. 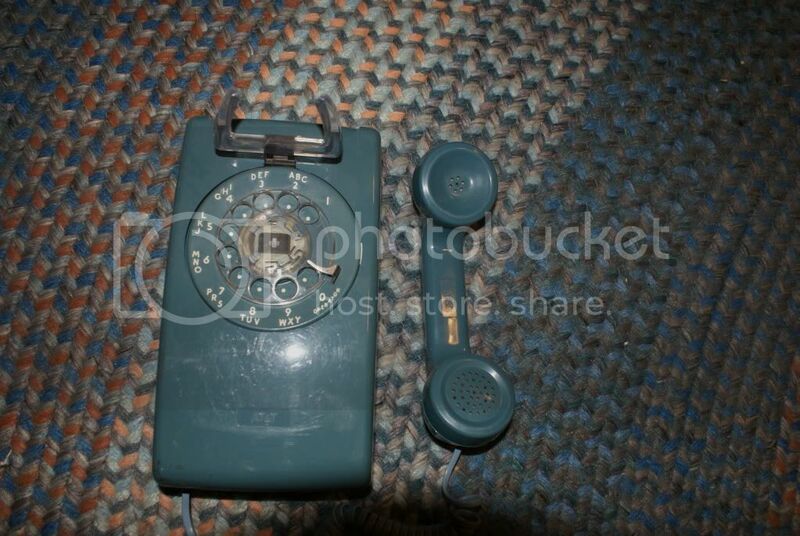 I love this dark blue color that Western Electric/AT&T made towards the end of their existence, I only have one other teal phone in my collection, a Western Electric touch tone trimline. It will be interesting to see, once it arrives, its date of manufacture. Also in the same auction, I won a cocoa brown rotary sculptura. I've always been interested in these and thought it would be nice to have one, but it was low on my list. The description says it doesn't transmit, does anyone know how you open the handset in one these things? I was watching that auction as well and considered bidding. Seemed like a good price for both phones tho I didn't see the ending price. Good luck with them, they look like nice phones. I have an AT&T marked 500 in the same color. Both the shell and handset say AT&T and every bit of it except for the dial bezel is painted blue. At least they did a good job of painting it. I hope yours is the real deal. Many of the Sculpturas with transmit problems I've worked on had defective 4228 networks. Good stuff to know, thanks. I'm hoping it will be something simple like a bad modular cord. Will report back when I have it in my hands. Phones came today. Haven't troubleshooted (troubleshot?) the Sculptura yet, but the Teal 500 was beyond my expectations. It's not mint condition, but very nice. The plastics are Teal blue through and through (not painted), and branded AT&T. The plastics and modern WE Teal dial were installed on a nice (not trashed) WE 500 base dated 3-65. The U5 receiver element in the handset is marked 9-22-821. Does that mean it's from 1982? Is that probably when the set was reconditioned to be blue? The Teal 500 is pictured below, after cleaning. Love the teal. I was able to get the wall version at a phone swap meet in Springdale Ohio for $5. This may be as close to a mediterranean blue WE554 wall phone as I will get. Regarding the Sculptura which the seller clearly listed as non-working, I worked with it tonight. The handset and handset cord are OK. Opening up the body of the Sculptura, I saw that someone replaced the handset modular jack with a line modular jack, which a handset cord fits into but doesn't make contact with reliably. Luckily I had a handset jack in my parts box and I restored that. But the set still has a problem, like you guessed paul-f, the 4228 network does have an intermittent open or short. The set is working for now, and this is a low priority for me because even though it's cool I didn't need a Sculptura in the first place, but if anyone has a spare Western Electric 4228 network they would like to sell for relatively cheap, please contact me directly. Thanks. Some call that color Country Blue. I don't know if the Bell System called it that or not. Yours is a really nice example. I have a painted one and it's kind of orange peel looking in places. The unpainted ones are better and they're a better choice if you plan to use it, since there's no paint to chip. To answer your question on when it was reconditioned, since it says AT&T on the housing, I would say 1984 or after, since they were Western Electric up until 1983, I think. All the Country Blue phones date to the 1980s or thereabouts and that color extended to 554s, Trimlines, 2554s, 2702s and 2500s too. This may be as close to a mediterranean blue WE554 wall phone as I will get. I don't know, Dan. Anyone that can find a Mediterranean Blue "mushroom" phone is destined to find a nice, soft plastic Mediterranean Blue 554. Back in 1986 when I bought my ivory WE 500 they had quite a few of the colors to choose from and this was one of them. I really considered getting the teal one, but instead went for ivory as it was a nice warm color and the folks had one back home so I'd match. Looking back I should have just dropped a C note and bought 5 of them, one in each color, but alas. This phone could have been refurbed at any point into the 90's by AT and T. I've seen a fair number of early 90's model 500s, 2500s, 2554s and 554s refurbs. They usually seem to have a sticker on the bottom with a dot matix-ish printed label listing the refurb date, and the plastics all just say "AT&T" and have no molded in date codes. I've got one that is a yellow 500 with an original date on the chassis of 1955, that had been modularized, all plastics replaced, feet replaced, dial and bezel replaced, and a refurb date of 1992.